Netanyahu to send professional teams to share with Germany and France the material on Iran's efforts to achieve nuclear weapons. Prime Minister Binyamin Netanyahu on Monday spoke by telephone with French President Emmanuel Macron and German Chancellor Angela Merkel. Netanyahu agreed with the leaders that he would – in the coming days – send professional teams to share with Germany and France the detailed material that has reached Israel regarding Iran's efforts to achieve nuclear weapons. Netanyahu also spoke on Monday evening with Russian President Vladimir Putin in wake of the exposure of the documents on the Iranian plan to achieve nuclear weapons. The two also discussed the situation in Syria and agreed to meet in the near future. The Prime Minister also intends to update the leaders of Great Britain and China forthwith, his office said in a statement. Earlier on Monday evening, Netanyahu revealed intelligence from Iran's secret nuclear files. 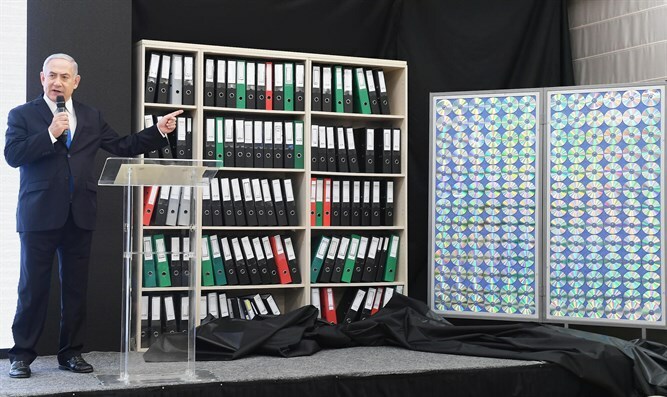 In a televised address, Netanyahu said that "Iran lied big time" when its leaders denied that the Islamic Republic had a program to develop nuclear weapons. He addressed U.S. President Donald Trump's upcoming decision on whether to remain in the Iran nuclear deal or not and said that he believed that Trump would withdraw from the deal. Trump has set a deadline of May 12 for Europe to fix the flaws of the 2015 Iranian nuclear deal, signed by his predecessor Barack Obama. Secretary of State Mike Pompeo said on Friday that Trump has not yet made a final decision on the matter but is “unlikely” to stay in the Iran nuclear deal unless it is substantially fixed. That sentiment was echoed by U.S. National Security Advisor John Bolton, who told Fox News on Sunday that Trump still has not decided whether to leave the Iran nuclear deal ahead of his May 12 deadline. Bolton said there was still some hope for European partners looking to convince Trump to amend the agreement rather than simply walk away from it.